Charles Fraser, one of the most famous and innovative developers in history, built the nation's first master-planned resort community in Hilton Head, S.C. Fraser invented the "master plan," where one developer controls every major aspect of the community -- from road layout to home design. One reason Hilton Head thrives today is because he was ahead of his time in terms of conservation and residential development coexisting with nature. Strict covenants preserve much of the island in a natural state. For example, there's a prohibition on white houses because they would stand out, and there are no neon signs or streetlights. Fraser's disciples were Jim Chaffin and Jim Light, executives who worked for him on the Sea Pines development, Hilton Head's first sub-development. Afterward, they started their own development company, taking many of the important lessons learned from Fraser to their flagship development -- Spring Island. 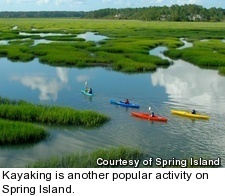 Just 35 minutes from Hilton Head and Savannah, Ga. -- in the heart of South Carolina's famous Lowcountry -- Spring Island is an exclusive 3,000-acre private community that is limited to just 410 families. It has one outstanding golf course as well as deep-water docks, an equestrian center, a quail-hunting plantation, historic Civil War ruins, a nature center with four full-time naturalists on staff, a visiting artist program and much, much more. Following Fraser's example, 1,200 acres -- more than a third of the entire island -- are set aside as a protected nature preserve. As a result, Spring Island won the Urban Land Institute's Sensitive Development Award. Along with the golf club, the unique Mobley Nature Center serves as a focal point for leisure activities. It is a library, museum, zoo and classroom, offering environmental programs to school classes, community groups and Spring Island members. There is also a main clubhouse for the community, the 10,000-square-foot River House, which includes a fine-dining restaurant and the community post office. The golf club has its own 8,000-square-foot clubhouse, with a more casual restaurant option. 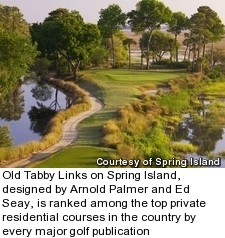 The Old Tabby Links on Spring Island, designed by Arnold Palmer and Ed Seay, is ranked among the top private residential courses in the country by every major golf publication. With a membership limited to 350, it is a true members club aimed for Spring Island residents. 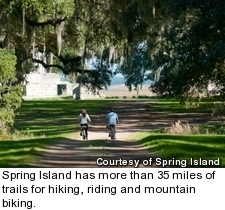 What's the selling point of Spring Island? It's a luxurious and private respite from the hustle and bustle of everyday life. It has no resort or public component and offers an informal, casual lifestyle augmented by some of the finest amenities money can buy. Very few communities this size have the laundry list of facilities here. And they are not only plentiful, but also world-class. For instance, the 12,000-square-foot sports center has a zero-entry family pool, a second lap pool, a tennis pro shop and six Har-Tru courts, a Pilates and yoga studio, cardio and weight training equipment, treatment rooms for massage and physical therapy and even a croquet greensward. The connected outfitter center provides members with the necessary equipment for kayaking, biking, fishing, boating, baseball, basketball and volleyball. 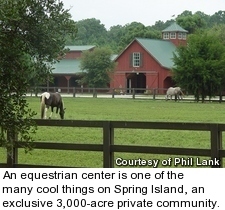 Likewise, the equestrian center has 24 stalls, 15 paddocks, two rings and the island has more than 35 miles of trails for hiking, riding and mountain biking. Anglers can try their hand at fly-fishing on a whopping 85 freshwater ponds or deep-sea sport fishing in the rich waters surrounding the island. The quail-hunting plantation is off-site on the nearby mainland and adds another 2,600 acres to the club's holdings. Of course, none of these facilities come cheap. Home sites range from $250,000 to $1.75 million and finished homes from $1 million to $4 million. There are no condos or villas. Currently, 250 homes have been built, and 45 of the remaining 160 lots in the master plan are for sale, spanning from one-third of an acre to 13 acres. Many homes are in the $2 million range, which will get you a 4,900-square-foot, four-bedroom, four-bathroom house with adjoining guest quarters, a gourmet kitchen and a private deep-water dock on a half-acre. 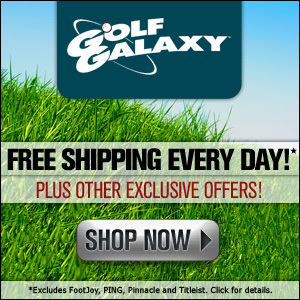 The golf club initiation is $125,000, and dues are $11,000 annually. Hilton Head Island, S.C.: The first master-planned community in the U.S.